More than eight out of 10 tech professionals have a favourable opinion of CEO activists, i.e. those business leaders who take a stance on issues they believe are important, according to a survey commissioned by Weber Shandwick in partnership with KRC Research. Leveraging on tech professionals’ preferences towards CEOs who take a stand on issues they care about, employers have the opportunity to make an impact on tech talent, who can be a hard to attract and retain segment. Tech professionals are highly enthusiastic about CEOs speaking out on today’s hotly debated issues. Notably, they express increased loyalty to an employer whose CEO is a public advocate. At a glance, job training, equal pay and data privacy are all ranked as the top three issues by tech workers in and outside of the technology sector, which they would like CEOs to address. CEOs and companies are finding that they need to be accountable to their values. Technology employees are particularly values-driven, with nearly nine in 10 believing a CEO has a responsibility to defend the values of his or her organisation. While tech professionals care most about issues that directly affect their jobs, they are also likely to consider the impact of technology on future generations of advanced technology professionals. The desire for CEOs to speak out is highly desired by high tech professionals across the seven markets in the survey, which include the U.S., U.K., Canada, Mexico, Brazil, India and China, without being limited to a single market. Women technology professionals are significantly more likely than their male colleagues to agree that CEOs need to defend company values, to have a more favourable opinion overall of CEO activism and to feel CEOs have a responsibility to speak out. Eight out of 10 women say their loyalty to their employers would increase if their organisations were led by CEO activists. 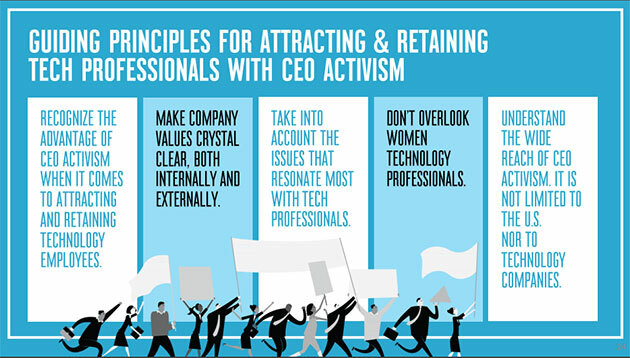 At a time when companies are looking to attract more women technologists, CEO activism may be an advantage to promote in hiring activities. Ever wondered which of your employees are the biggest advocates of your company, and which are most likely to negatively affect yo..
A new event by Human Resources will help you gain a serious edge in ensuring your talent is ready to take on the biggest challenge..